As our local telcos are improving and rolling out their LTE network infrastructure nationwide, ABS-CBN mobile has also started offering LTE capable SIM cards to all prepaid subscribers. The benefit of having this kind of sim is that you’ll get fast download and upload speed internet access using your smartphone, tablet, broadband and pocket Wi-Fi when connected to cellular data. If you’re more on the video content type of mobile data user who love to watch movies and stream live shows, this SIM will surely fit your lifestyle. 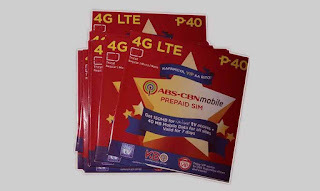 ABS CBN Mobile comes in the tri-cut type where you can use it on 3 kinds of SIM card slot e.g. regular, micro and Nano. To fully benefit the features of the SIM, you need to have and LTE ready device and your location must be covered by the Globe’s 4G/LTE network. Oops! don’t worry, LTE SIM will also work on your non-LTE devices and can connect to 3G/HSPA+ signal type. Note: This SIM is exclusively available to select SM stores nationwide (Manila, Cebu Davao). You can visit ABS CBN Mobile website to know the list of stores. If you want to test how fast LTE is, use your free MB’s, then try to do a mobile speed test and tell us the results. You can also register to ABS-CBN Mobile Internet Surf Promo after you fully consumed the SIM card freebies. Hopefully they will come up with an exclusive LTE surfing promo offer to their prepaid subscribers. If the SIM is a thumbs up for you, do share this post to your contacts to let them know the good news. pano yan pag promo sa text ?